Ready to take the plunge into indoor gardening? Caring for your new additions needn’t be a mystery or cause for brown thumb jitters. Start with the right plant for the location — simulating the light, temperature, and humidity the plant would enjoy in its native habitat — along with a suitable container and soil. Then all you need to keep your indoor garden in shape is a bit of know-how and practice in the basics of watering, feeding, grooming, and controlling pests and disease. A piece of cake! The soil your plant lives in provides support to keep it securely in place, as well as storing water and nutrients and air for the roots. Quality potting soils should be low in soluble salts, slightly acidic, and capable of holding essential nutrients for plant growth. The pH of commercially prepared potting soils is usually slightly to moderately acidic, which is acceptable to most houseplants. When selecting a container for your plant, consider size, material, and drainage. There are lots of materials to choose from: plastic containers may be better for moisture-loving plants, while breathable materials like porous ceramics or wood are best suited to plants that can handle drier soil. The container should be appropriate to the size of the plant — slightly larger than the root ball and with at least one hole at the bottom to facilitate drainage. 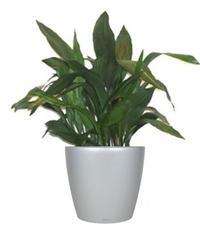 More houseplants die from getting too much water rather than too little. Water needs vary and depend on the species and size of the plant, the type of container and soil, and the growing conditions. While consistent levels of moisture are desirable, it’s better to let soil go moderately dry between watering rather than have soggy soil. Water thoroughly; a little water draining out of the bottom of the pot is fine. Just don’t let the pot sit in water for long periods of time. Providing a steady diet of nutrients to plants growing in containers is easiest when using a water-soluble complete fertilizer formulated for houseplants. Mix according to label directions. Once a month, April through September, is usually adequate for most non-flowering plants. The plant should be well watered before the addition of liquid fertilizer to prevent damage to roots and leaves. Don’t overfeed; many of the pests that plague houseplants thrive on the lush new growth that results from lots of fertilizer. Cleaning leaves to remove dust helps to maintain the amount of light the plant receives. Plants with smooth leaves can simply be wiped with a damp cloth while those with hairy leaves can be brushed with a small, soft paintbrush. An easy way to both clean and refresh plants is using a faucet sprayer and rinsing with warm water in the kitchen sink (or the shower for ferns or large plants). If you have some brown portions of leaves (most often a result of low moisture), use scissors to trim away the damaged portion of the plant. Light is probably the most essential factor for indoor plant growth and one of the most problematic. The sunniest location inside often provides less light than shady locations outside. Light is necessary for all plants because they use this energy source to photosynthesize their food. Which direction do your windows face? North-facing windows provide prime locations for plants; however, if your windows face south, your windowsills may be too hot for plants to survive. Indirect light is sufficient and may be preferable for many plants. If your home or apartment has a dark space, choose a plant for that space that loves shade. However, all plants need light, so keep in mind that there are some locations that are too dark for any plant to survive. Even the most shade-tolerant plants require several hours of indirect light every day. As your plants grow, they may need to move up to larger containers. If the plant has stopped growing, has visible roots on the surface of the soil or emerging through the drainage hole, it’s time to pot up. Select a pot a couple of inches larger than the existing one and use some fresh potting mix when planting. Most problems are a result of growing conditions: too much or too little water, light, heat, or fertilizer. These are usually easily corrected. Houseplants are susceptible to some pests — aphids, mealybugs, scale, spider mites, and whiteflies are the most common. All are sucking insects that can simply be nuisances or, if left unchecked, may cause the demise of the plant. Aphids are small, soft-bodied insects ranging from green to yellow to nearly black and love succulent new growth. Mealybugs tend to nestle in cracks and crevices and look like tiny pieces of cotton. Greenhouse whitefly adults are somewhat gnat-like and covered with fine white wax; you’ll often see little “clouds” of them flying around when the plant is disturbed. Evidence of tiny two-spotted spider mites is fine webbing on the undersides of leaves. Soft scale is probably the hardest to detect — they resemble small droplets along twigs and stems and the undersides of leaves. In addition to their direct damage to the plant, all these sucking pests secrete sticky honeydew that supports the growth of black sooty mold and attracts ants. If pests are isolated to a small portion of the plant, simply prune out the infected area and dispose. Light infestations can be managed by hand-picking pests or blasting them with water from a squirt bottle or hose. A spray with neem oil or horticultural oil may reduce pests by smothering them. Insecticidal soaps are effective for managing aphids, mites, and whiteflies. For mealybugs and scale, a solution of rubbing alcohol (70% isopropyl) can be applied directly on the pest either with a light spray, a cotton-soaked swab, or soft infant’s toothbrush, and repeated once or twice at weekly intervals. 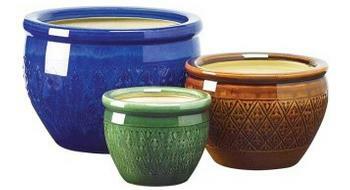 Be sure to sanitize the entire pot and treat the surface of the soil. If none of these methods work, a systemic insecticide labeled for use on houseplants may be effective. As today’s homes, schools, offices, and public buildings are tighter and more energy efficient than ever, they can trap potentially harmful organic chemical pollutants commonly emitted by paints, cleaning supplies, building materials, furnishings, dry-cleaned clothing, and more. According to the U.S. Environmental Protection Agency, we Americans spend about 90% of our time indoors — that’s a lot of exposure to those undesirable pollutants. Just as trees are vital to the health of our outdoor environment by purifying the air and producing valuable oxygen for us to breathe, indoor plants perform the same beneficial functions on a smaller scale. A study done in the late 1980s by the National Aeronautics and Space Administration (NASA) together with the Associated Landscape Contractors of America (ALCA) found certain houseplants were able to remove as much as much as 87% of indoor air pollutants within 24 hours. Of the plants evaluated, researchers came up with a list of easy-to-grow houseplants proven to reduce the most prevalent organic contaminants — formaldehyde, benzene, and trichloroethylene. Chances are, all houseplants provide some level of air purification. • Cast-iron plant (Aspidistra elatior) — A favorite of the Victorian era when houses were far from bright and airy, it is one of the most carefree plants you can grow indoors, surviving with very low light and general neglect. 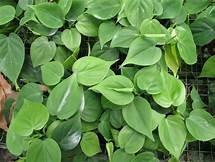 This slow-growing tidy plant with big, bold, emerald-green leaves is practically indestructible. • Chinese evergreens* (Aglaonema species) — This is a group of durable foliage plants adorned with dramatic silver and green lance-shaped leaves. They perform well even in dim light (though leaf markings will be bolder in brighter light) and prefer being slightly pot-bound, so rarely need repotting. • Members of the grape family — The kangaroo vine (Cissus antarctica), oakleaf ivy (Cissus capensis) and grape ivy (Cissus rhombifolia) are ideal for locations where they can drape their rather delicate-looking, vine-like foliage. They withstand neglect and poor conditions and keep right on growing. • Golden pothos* — Also called devil’s ivy (Epipremnum aureum), this is a hardy plant with fleshy, golden to ivory, variegated heart-shaped leaves on long stems that can grow to eight feet or more. • Umbrella tree (Schefflera actinophylla) — This houseplant features glossy oval leaves that appear like little umbrellas at the ends of branches, growing to six feet tall or more. A dwarf variety, Schefflera arboricola, is a smaller and bushier plant. • Snake plant or mother-in-law’s tongue* (Sansevieria trifasciata) — A member of the agave family, this plant does well in very dry conditions. The striking deep green, erect, strap-shaped leaves, laced with bands of lighter green or yellow, grows 18-30 inches tall. • Dracaenas* (Dracaena species) — These are leafy members of the lily family with a broad range of sword-shaped, slender leaves; many striped cultivars display jewel-toned colors. • Heartleaf philodendron* (Philodendron scandens) — Also called the sweetheart plant, it is another vining plant that stays small and is exceptionally drought-tolerant. • Spider or airplane plant* (Chlorophytum comosum) — This is a great choice for hanging baskets, sporting rosettes of long, green and creamy white variegated leaves. It produces baby plants at the end of long stems that are easily propagated. • Boston fern (Nephrolepis exaltata ‘Bostoniensis’) — This graceful plant features long, arching fronds densely covered with leaflets. It is not an overly fussy plant if given the right conditions. Humidity is the key for keeping this gorgeous plant happy. *Varieties included in the NASA study and proven to reduce organic chemical pollutants. You can purchase houseplants at nurseries, home improvement centers, farmers markets, even via the internet. A healthy specimen should have a well-balanced overall form, with blemish-free foliage that is the right color, shape, and size for the type of plant. Check for any signs of insects or disease — you don’t want a pest hitchhiking home with you. By employing a few basics of care, you’re now on your way to growing healthy and happy houseplants. Original articles by Nanette Londeree and Barbara Euser for the Marin IJ. Edited for the Leaflet by Jane Scurich.